ConceptDraw DIAGRAM is a professional flowchart software. Numerous vector stencils, samples and templates created by designers included in the basic bundle allows you to draw any type of flowchart and use flowchart symbols. Vector stencils from object libraries allow you to use RapidDraw technology. By clicking on direction arrows you can add a new flowchart symbol to the flowchart or process flow diagram. This technology gives users the ability to visualize structured data. 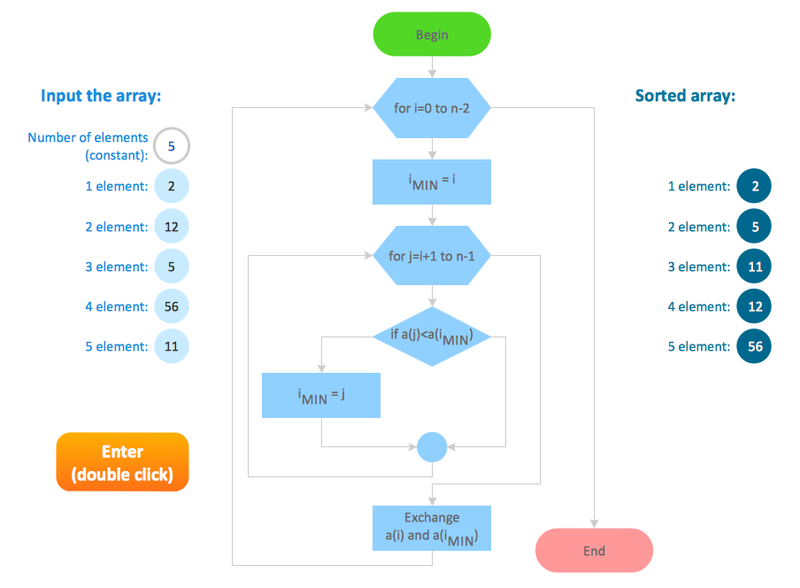 This example of computer algorithm flow chart visualizes the steps and logic of selection sorting method. This is typical process flow diagram of computing an algorithm. Used flowchart symbols: condition symbols, decision symbols and operator symbols. Use ConceptDraw DIAGRAM diagramming and business graphics software to design your own flowcharts of computer algorithms. Use ConceptDraw DIAGRAM v12 diagramming and business graphics software to draw your own flowcharts of computer algorithms. Flowcharts are helpful in understanding a complicated process. ConceptDraw DIAGRAM v12 allows you to creating a simple flowchart. The ability to create flowcharts is contained in the Flowcharts solution. The solution provides a set of special tools for creating flowcharts. If you ever tried programming, you could face a lot of problems as a beginner. To help yourself, create a flowchart to follow an algorithm logic. Flowchart represents a program as a sequence of steps depicted in special symbols for each type of action. This image of the interactive diagram made in ConceptDraw DIAGRAM v12 applying the Live Objects technology. The diagram shows the effect of Selection Sort algorithm. The left part of the chart is the input area. The diagram in the central part of the drawing is a flow chart showing of the selection sort algorithm. The flowchart includes basic flowchart symbols, that represent various stages of algorithm. The flowchart symbols are connected with arrows ended lines, that depict the direction of the process flow. On the right side - the result is displayed. 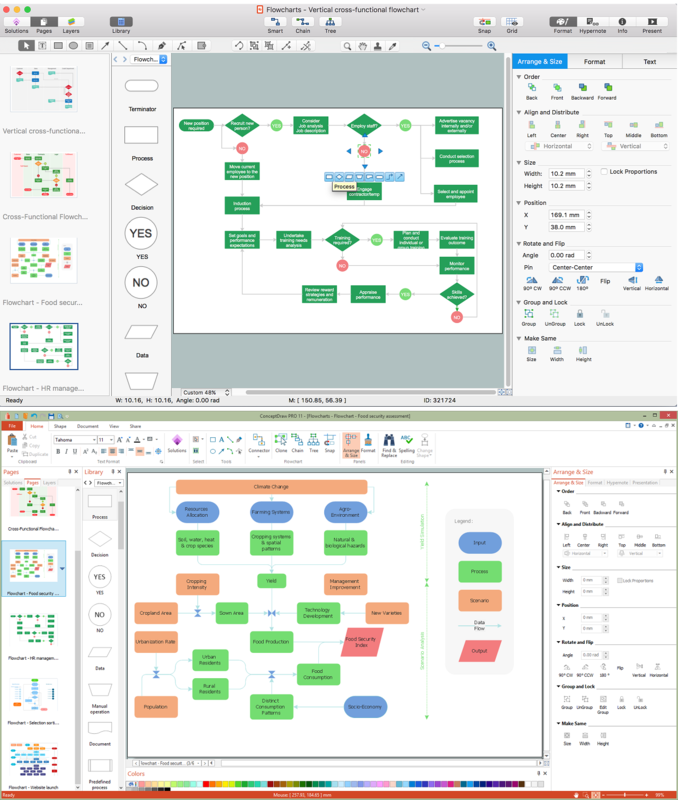 ConceptDraw DIAGRAM v12 is a software for producing flow charts. The software delivers built-in object libraries with vector stencils that allows you to use RapidDraw technology. By clicking on direction arrows one can add a new object to flowchart. Users can start drawing their own flowchart diagrams in fast and simple way. Do you like the professional schemes that you can find on the Internet? Take into account that the most part of them is made using the Best Flowchart Software and Flowchart Symbols. Try you own powers in creating such diagrams! Flowcharts are the most business diagramming tool. If you are a business manager, you can use flow chart to depict work flow in your organization, develop the effective organizational structure and present the information to investors or other stakeholders. Combining the smart management solutions with ConceptDraw DIAGRAM v12 diagramming engine delivers the set of comprehensive flowchart tools necessary to support professionals in their creativeness and business activity. To design a good workflow you have to focus on process analysis, not using the a drawing tool. This is more possible with ConceptDraw DIAGRAM v12 software that brings the most natural drawing manner you have ever tried. First, define steps and procedures using simple rectangle shape, then select all shapes and click the Chain button to connect all shapes just in one click. After that you are able to modify some relations if needed. When searching for a diagramming tool, we look for a powerful and reliable software that would be easy to use. To mention one, ConceptDraw DIAGRAM v12 has all the necessary features to create cross-functional flowcharts (Swim Lanes) quick and effortlessly. You can draw swim lane diagrams in both vertical and horizontal ways. This cross-functional flowchart displays a payroll process. It explains to each participant his role in the process depending on the category, represented with swimlanes. Using this flowchart, every employee can easily find out what he can expect in terms of salary. Generally a cross-functional diagram enables one to take a look at processes with a wider scope and with more precision than simple flowchart. Business process capturing using cross-functional flowcharts can be useful for stakeholders and managers to define clearly the staff's roles and responsibilities.